What Day Of The Week Is October 23? 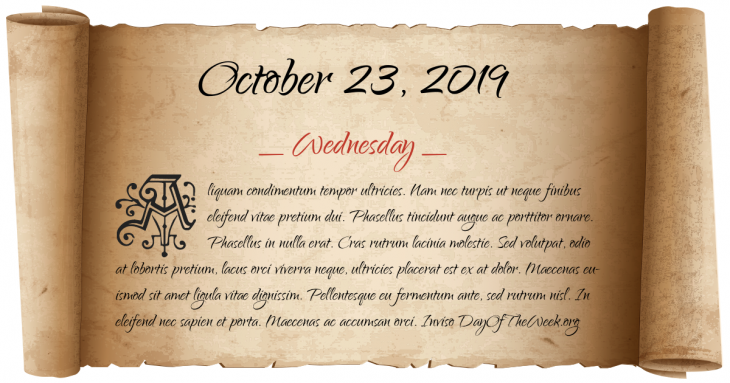 October 23, 2019 is the 296th day of the year 2019 in the Gregorian calendar. There are 69 days remaining until the end of the year. The day of the week is Wednesday. Roman Republican civil wars: Second Battle of Philippi – Mark Antony and Octavian decisively defeat Brutus’s army. Brutus commits suicide. Valentinian III is elevated as Roman Emperor, at the age of 6. First Balkan War: The Battle of Kumanovo between the Serbian and Ottoman armies begins. World War II: The Battle for Henderson Field begins during the Guadalcanal Campaign and ends on October 26.
Who were born on October 23?